Show how to use bootstrap methods in SAS/IML Studio to compute both a bootstrap estimate for a statistic and also an estimate for the standard error of the statistic. In this example, the statistic is a 25% trimmed mean. This program demonstrates how to write a very simple bootstrap program in IMLPlus. SAS/IML Studio 3.2 or SAS Stat Studio 3.1 and Base SAS. The results of running the attached IMLPlus program are shown in the Results tab. In the basic bootstrap algorithm, you sample (with replacement) from the data. For each bootstrap sample, you compute a statistic for that sample. The union of the statistics forms the bootstrap distribution. The mean of the bootstrap distribution is an estimate of the statistic on the original data. The standard deviation of the bootstrap distribution is the bootstrap estimate of the standard error of the statistic. Generate a statistic for the original data. For this example, the statistic is a 25% trimmed mean. Resample from the original data. In this program the resampling is implemented in SAS/IML, but you can also resample by using the SURVEYSELECT procedure. Resampling with the SURVEYSELECT procedure is discussed in Cassell (2007) and Wicklin (2008). Compute the statistic for each bootstrap sample. In this step, the analysis in Step 1 is repeated for each BY group. Compute the mean and standard deviation of the bootstrap distribution. The bootstrap distribution approximates the distribution of the underlying statistic. The standard deviation of the bootstrap statistics estimates the standard error of the statistic. Visualize the original data by creating a histogram. Visualize the bootstrap distribution by creating a second histogram. Add lines to the second histogram that indicate the sample statistic and the mean of the bootstrap distribution. The program can be further extended by using the 5th and 95th percentiles of the bootstrap distribution to approximate a 90% confidence interval for the parameter. Cassell, David L. (2007), "Don't Be Loopy: Re-Sampling and Simulation the SAS Way," Proceedings of the SAS Global Forum 2007 Conference. Cary, NC: SAS Institute Inc.
Wicklin, Rick (2008), "SAS Stat Studio: A Programming Environment for High-End Data Analysts," Proceedings of the SAS Global Forum 2008 Conference. Cary, NC: SAS Institute Inc.
Below is an image showing the results from the Bootstrap.sx program. 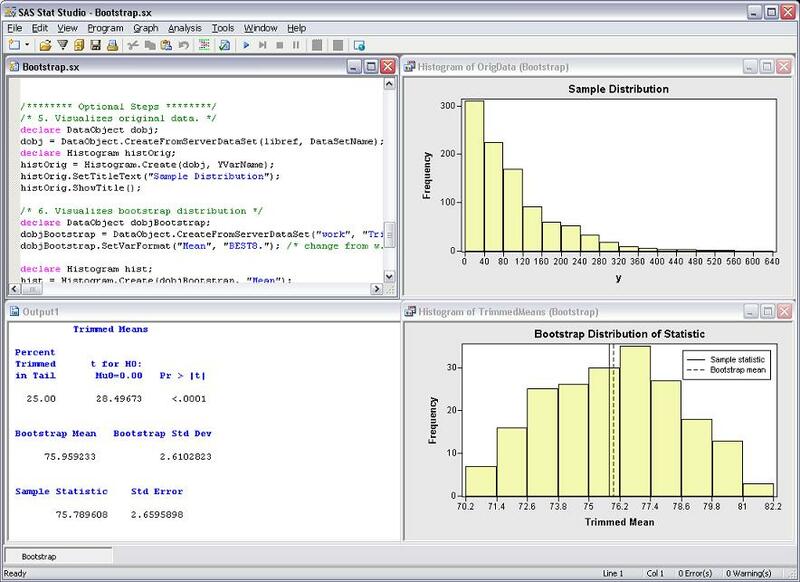 Shows how to use bootstrap methods in SAS/IML Studio to compute both a bootstrap estimate for a statistic and also an estimate for the standard error of the statistic.